This is going to be one of those yearly summary posts–some good, some bad, some whatever. 2018 has been another one of Those Years. You know, the sort where you’re flailing about at everything, trying to get things going and stuff just keeps happening…and happening…and happening. I made some book sales, found some cool new fans as well as kept up contacts with old fans, did stuff with the horse, and etc. Not that it’s been a particularly bad year…it’s just been one of Those Years. Crappy moments and shining moments, all wrapped up together. Part of the reason (besides politics which is absolutely horrific, horrible, crappy, ick, and I’m totally back in fretting about apocalyptic scenarios–well hey! I’m writing an apocalyptic book right now and the next fantasy book will also be apocalyptic in tone so I’m right on track here!) is that I think I really started kind of feeling my age this year. The area that has suffered the most has been this blog. Writing-wise, I’ve been chugging along, though not as faithfully as I would like. I think the sales of Pledges of Honor are finally slowing down…but I’m not going to gripe, because it has been selling steadily over the past three years, ever since I published it back in 2015. Sales still occasionally pop up for the Netwalk Sequence series, though no one really seems to go too far with it. I…have plans to do something about that. Pledges did earn itself a Semifinalist position in the Self-Published Fantasy Blog-Off. I had hopes for higher, but c’est la vie. A review is supposed to come out for it next week from one of the reviewers. So let’s look at Joyce’s Year in Writing, Horses, and Health. I published two books and edited an anthology, for starters. 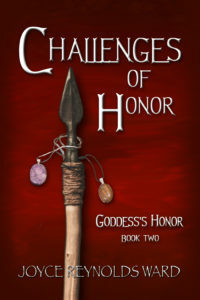 Challenges of Honor, the second book in the Goddess’s Honor series, came out in the spring. It hasn’t sold as well as the first book, but you know, things can change. Blurb and linkage for Amazon here. 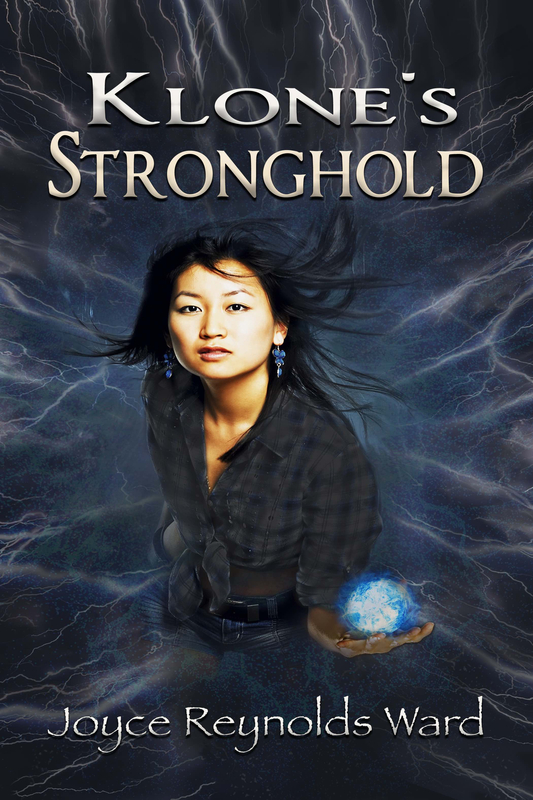 Klone’s Stronghold, a contemporary fantasy featuring a mix of supernaturals, cryptids, and family issues in the isolated Bucket Mountains of NE Oregon, came out in the summer. It’s not done as well as I had hoped; nonetheless I’ve got some ideas for a sequel to it. Linkage for Books2Read (Apple, Nook, Kobo, etc) here. I’m currently working on a rewrite of a previously published novella, Seeking Shelter at the End of the World. The new title is Beating the Apocalypse. It’s not going to look much like the original. I’ve added two viewpoint characters, eliminated at least one and maybe two deaths in the course of the book (though I do kill others), am at about 20k additional words, and am making it a MUCH more complex book. I also edited a themed anthology, Pulling Up Stakes, (includes my Oregon Country story “To Plant or Pull Up Stakes”) and am working on a second one, Whimsical Beasts (which will include my story “The Wisdom of Robins”). Pulling Up Stakes Amazon details here. Return to Wickmasa (post-Pledges of Honor) B2R (includes Amazon), Cleaning House (post Challenges of Honor) B2R (includes Amazon), and Unexpected Alliances, B2R (includes Amazon). I’ve decided not to mess with loading short stories directly to Kindle but will load them into Kindle via Draft2Digital. I wrote Going Gently for the Netwalk Sequence universe. B2R (includes Amazon). “The Cow at the End of the World” came out in Well, It’s Your Cow, edited by Frog Jones. Amazon. I have two new stories in circulation (“A Quilter’s Stellar Sandwich” and “My Woman Left Me, My Dog Hates Me, and There Goes My Truck”). I’m also marketing a novella, Bearing Witness, which is a weird alt-Western set in a universe I’m now calling the Vortex Worlds. I was originally going to self-publish it but decided to try my luck with the trad pub market so far. I’m underwhelmed, so it may go on the publishing schedule this spring. Then I started playing around with Medium. I’m not very diligent about posting essays there yet, but I do have a few up. I’m also toying with writing a poem a week and posting it on a separate blog page. I plan to switch hosts in this coming year, and have temporarily set up a site on wordpress.com. I’ll be transferring the whole domain at some point here. Just works better for me than what I’ve been doing. Mocha turned 18 this year, and is fully a mature, opinionated mare. 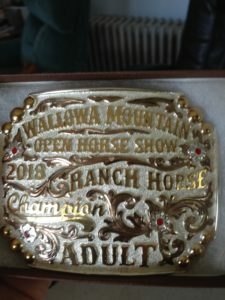 But we achieved a bucket list goal by winning a show series buckle in the local show series in the Ranch Horse division. 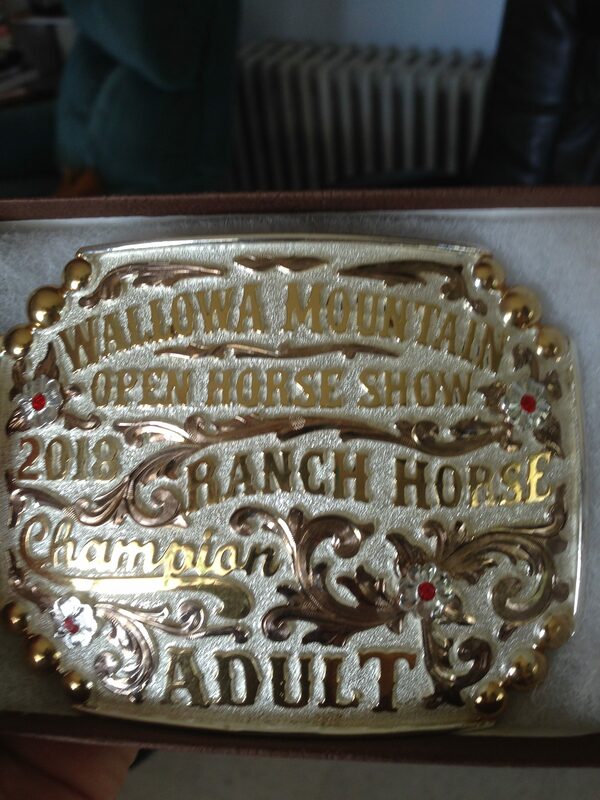 So I now sport a genuine, honestly-won, silver belt buckle. She was pastured up by the east moraine of Wallowa Lake this summer, so we spent some time riding the moraine and doing Real Trail Horse stuff. She loves it. One day she was edgy and energetic so I sent her straight up the side of the moraine (actually a fairly steep climb), with plans to sidehill it if she encountered problems. She didn’t. She went into the winter looking the best I’ve seen her in a long time, her back completely filled out around the spine and minimal sign of rib. Nonetheless, she’s getting up there in years so I’m not pushing her. She’s let me know that she really, really likes the idea of gaming as opposed to rail classes but OKAY WE WILL DEAL WITH STUPID RAIL STUFF IF THERE’S GAMING (keyhole and barrels are her favorites). As long as she enjoys the notion of “turn and burn” we’ll keep doing it. We did our first winter lope under saddle a couple of days ago (it’s been a not-so-good winter for riding outside) and she was full of energy, ready to go, and everything you want to feel with a mature horse living outside 24/7. This is the year that the teaching stuff has pretty much gone away. I substitute occasionally, and will be teaching a writing class in February, but otherwise–my long-term substitute gig abruptly ended at the end of the semester in January, and I’ve not been actively drumming up anything other than writing coaching business. I think it’s time to move away from K-12 teaching–I’m ready. This year I feel like I’m really starting to get with it in quilting. I’ve made two small quilts and a bigger one as well as several small wall hangings. I think I will start working toward art quilt wall hangings for the science fiction and fantasy market. Other craft work is “meh”. I do have a few fans of my jewelry but not enough to put much energy into it outside of the occasional bazaar. Well…I might start trying the science fiction art show circuit again. Health-wise, I had a real wakeup call in the fall of 2017 when I had problems hiking because my hips were too tight and I had issues. Plus I was having leg spasms bad enough that I could watch them go in waves down my right leg at their worst. Things were not good. I hurt a lot. Not the earth-shaking, major pain-killer pain, but that dragging soft-tissue coupled with arthritic pain that no traditional doctor takes seriously in a woman, especially if you can’t/won’t handle muscle-relaxants for the soft tissue stuff. And then there was the persistent shoulder issues. Then I discovered a shiatsu massage pillow. That led to acupuncture and chiropractic work in addition to my regular massages because I realized part of the relief I was feeling came from adhesions getting broken loose. I also got smart about living in the world of ice/snow and bought hiking sticks and Yaktrak shoe chains to reduce the risk of falling (still happens but not as much). I started using a neck pillow for any drives over two hours. Additionally, I started using CBD and THC topicals, as well as oral CBD. Things aren’t perfect, but I can move again. There’s one troublesome spot in my right hip which has plagued me for thirty-eight-some years, thanks to a fall while jogging, but it’s much improved from what it’s been over the last ten years. What’s even more encouraging is that I have the urge to move again. I want to work out. My muscles are tight on a three-day cycle, but it is absolutely not the same sort of thing as I was experiencing before. I’ve also gone back to using moisturizer and makeup. Part of it is that I have an excellent source of mineral-based makeup here in Enterprise–Wild Carrot Herbals has their company store here (as well as their warehouse/manufacturing headquarters) and they carry a nice line of makeup. I went back to my favorite Elizabeth Arden Ceramide-based moisturizers and foundation. It really does make a difference, and the moisturizer holds up to a lot of winter weather. I do need to find something different for hot summer days, though…. In any case, it’s been a year. I’m hoping to be more energized in 2019–if anything, that’s my goal for the year ahead. I want to advance my writing, perhaps expand my craft work into art shows, and otherwise. I’ll probably put up another post about 2019 goals tomorrow. We’ll see. Comments Off on Well. That was 2018. …that dang, you have been working. One of the things that happened today was work on a couple of press releases, one for a book reading/signing/informal Q and A about self-publishing at JaxDogCafe in LaGrande in December, and the other for a three-hour self-publishing workshop I’m doing with Fishtrap in February. I decided that perhaps for the bio I should mention how many anthologies I’ve been in, how many books I’ve published, and how many short stories I’ve published (some of which are anthology repeats). Twelve books. Doesn’t count the one I pulled from eTreasures publishing. At least twelve anthologies (I think I missed a couple that aren’t on Amazon). And at least twenty self-published short stories…many of which are either series world-building stories or anthology reprints. That doesn’t count the ones that I’ve published in various magazines–so add at least ten-twelve more that don’t show up in my Amazon page. Um. Okay. Wow. Does this mean I’m at the point of accumulating a sufficiently significant body of work that I might someday become an…overnight success? Dare I hope? Meanwhile, even though I’m not officially doing Nanowrimo, I’ve been productive. As in I’ve blocked out a full story, written an essay, written a story, and am getting ready to write that blocked-out story (and wrote a story in October). I think I’ll be starting Beating the Apocalypse in December…somehow I just couldn’t do it in the heat of summer. I think things are getting back on track writing-wise. Yay. Or so it seems. It’s a rough draft finish, of course, and I think that I’ll probably polish it and release the polished version for sale in December. Meanwhile, I’m going to make it available to my newsletter subscribers in rough draft form, with a cover that reflects that status. In some ways, this was a tough story to write while also being compelling. It was about death, and transition, and aging. Not sure I’m completely satisfied with the ending–I never am, especially in the roughs–but it did come to an end. Will this be the final Netwalk Sequence work? To be honest, I’m not sure. I left some loose ends hanging because they’re relevant to the backstory in Star Shepherds (which is not going to be started until I get some other projects out of the way and do some necessary research). I may go back and tweak a few of those because one new character (who will be very relevant to Star Shepherds) doesn’t get enough foundation. But I couldn’t do that until I finished the story, and, well, gotta have time to format it into reading form and get it ready to go on BookFunnel. But make no mistake, this is a transition story between Netwalk Sequence and Star Shepherds. I may write a few more stories set in this time period as world building for Star Shepherds. I just don’t know yet. There’s other writing I need to get done, which also includes some work on getting spec stories out instead of self-pub stories. And then there’s Beating the Apocalypse, which I’ve delayed starting because I thought I was going to have some conflicts that have now gone away. I may still put off starting up Apocalypse until later in the month so I can get some short writing done. We shall see. Like I said yesterday, I had no real intention of opening the Netwalk Sequence again. But this story, I tell you…it’s at 4300 words and growing. At this point, I’m looking at a probable novelette length. I don’t think it’s a novella, but I’ve been putting down a lot of breadcrumbs that could sustain a longer story than just 5000 words. In this story, we’re seeing Melanie after a stroke, with her brother Andrew near death from cancer, and…one more crisis is thrown at them, at the end of their lifespan. I started moving past the basic mechanism of that original story concept to deal with these characters who are facing the question of “do I upload into digital life and why”–where the why may affect the long-term survival of humanity. The question of aging, in a world where digital life is possible. It’s…interesting. In any case, I expect to have it ready in rough form for a newsletter giveaway. Actual publication will be probably in November or December. Totally unplanned, but…worth it, I think. I hadn’t planned to write anything further in the Netwalk Sequence after I finished Netwalking Space, at least not for a while. Oh, a far future version was on the publishing schedule (Star Shepherds), but as for anything immediately after Space? And then a particular scene kept popping into my head when I drowsed off to sleep. An old Melanie and Andrew on the Moon, Andrew near death, and in need of Melanie’s assistance. The scene kept haunting me. Why did Andrew want Melanie to come to the Moon so urgently, at an age and fragility when it would be daunting? To say goodbye, true–but there was something more going on. Well, it’s a story. Possibly an introduction or worldbuilding for the foundation of Star Shepherds. I should be done with it in time to give it away for my next newsletter release. Let’s just say it’s an interesting premise. Well, release day was actually YESTERDAY…but I wasn’t feeling well, and I’ve learned that doing promo work while not feeling well is not always the best thing to do. Anyway, it’s out! 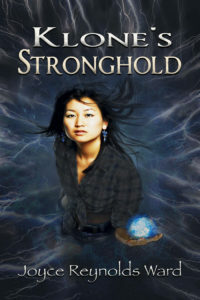 My first foray into long-form contemporary fiction, Klone’s Stronghold, is now available online! In a world of supernatural beings, not knowing what you are is dangerous. After Reeni Dutta’s ex-husband Karl attacks her at a music festival, she finds a refuge teaching cryptid construct children at Klone’s Stronghold in northeastern Oregon’s isolated Bucket Mountains. But things are not as they seem at the Stronghold, from the older proprietors of a nearby store and the Stronghold’s leader Alexander Reed Klone, to Reeni herself. She discovers it’s not just Karl who seeks to control who and what she is, but forces from her past that threaten her present. Can she learn the truth about herself and do what is needed in time to defend the Stronghold? Available on Amazon, Barnes and Noble, iBooks, Kobo, and other places. An exhausting, at times exciting, but still tiring week. Husband had some eye appointments in Portland that bracketed the weekend, but there was enough stuff up in the air that I only could really plan one get-together with someone I’ve missed except for tiny grabs for the last few trips. It was probably a good thing I didn’t overplan the Portland time, as I ended up down flat sick from an allergic reaction to all the damn pollen. The same thing happened last year, and I had a less extreme reaction in March, so….yeah. I suspect this means that this is now a thing. On the other hand, I found a cromolyn sodium nasal spray and that’s really helping with things, much better than its steroidal cousin and much less harsh. So I now need to find someplace other than the Kaiser Pharmacy to buy it OTC. We did spend two days skiing. The first day was lovely in spite of the stormy weather, and the second day was full of the heavy deep powder the Cascades is known for. Three runs and not only was my back done in but my knee was complaining. So we stopped. We’d considered skiing on our way home yesterday, but I was so tired and hurting that I determined it wasn’t a good idea. All the same, everything works really well on the slopes again. I’ve got my control back and I’m not struggling like I was so much of the time last year. I’m now thinking that everything I’m doing to address the lower back pain is paying off in this respect. Yay! Then we spent two days hunting razor clams. OMG. Both days were hard clamming days. Lots of false shows to fake us out, which meant a LOT of digging. The first day wasn’t too bad as we were four clams shy of a full limit. The lot were amongst the biggest clams we’ve ever dug, though, consistently large. I found a medium-sized cockle on the beach, still alive, and claimed it. That day was also good for finding hermit crabs, a live snail, and sandpipers. At one point I stood still as the sandpipers scurried around me, several coming within five feet of me. Sweet. It was also a lovely day for April on the Oregon Coast. Very light wind, sunny, and relatively warm. A good day to be down on the beach, but after the hard work clamming none of us felt like following up with fishing like we had planned. The second day was tougher. We never did get any good clam shows, and ended up with just one limit between the three of us. It was another gorgeous warm day on the beach, though. Not as much bird action, nor did I find any crabs. My back ached so bad that I went back to the truck and brainstormed the latest rough draft work, including a quick sketch on a short story idea. Then we packed up, went back to Portland, and headed back to Enterprise yesterday. Three short story ideas mugged me on the way back. 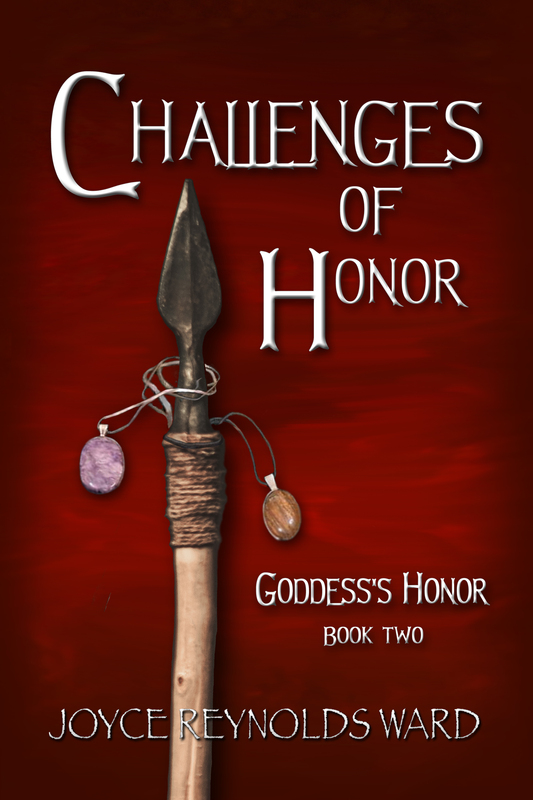 I’m not sure why that part of my brain is waking up again–perhaps being finished with Netwalk, and two-thirds of the way through Goddess’s Honor is a factor? Dunno, but I’m not going to ignore it. I sketched the three stories out last night. They’re all tied to some other stories I’ve been working on, contemporary fantasy or Western fantasy. And now for the first time in a week I’m not having to wake up and rush around to go somewhere. Later on today I’m going to introduce Miss Mocha to the wonderful world of saddlebags. But spring is erupting in Wallowa County and I’m itching to get on the front porch for a porch writing session. Ah. Lovely.